WHEN this work was commenced by the author he did not intend it to be more extent than seven hundred and fifty pages; but, as he proceeded with his task, materials for it accumulated on his hands. Even since the early chapters were sent to press, he has been under the necessity of introducing new matter that has swelled the volume to its present size; and he fears that faults of omission, as well as of commission, may still be laid to his charge. 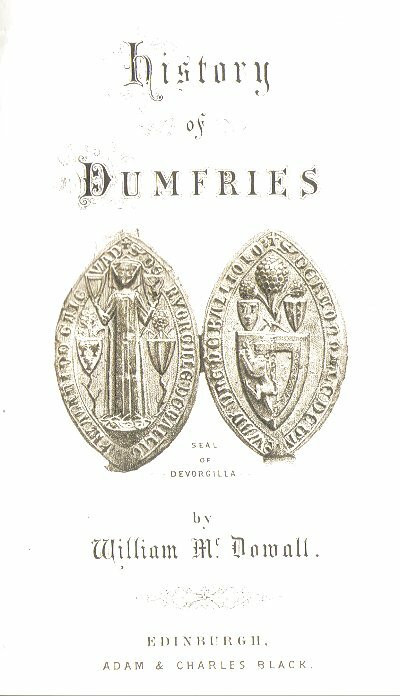 Numerous Dumfriesshire "notices" have been introduced, but only when they were required to make the general narrative intelligible, or to illustrate in some way the annals of its principal town: in no sense, therefore, does the work profess to be a County history. Two volumes as portly as the present one, however well composed, could scarcely do justice to such a prolific theme. The thanks of the author are due to Mr. David Laing, of the Signet Library, and the Curators of the Advocates’ Library, for the obliging manner in which they facilitated his researches. All the local custodiers of documents which the author required to consult were not less considerate: and to them his grateful acknowledgments are also tendered. The numerous stores of information that are under the care of Mr. Martin, the town clerk of Dumfri es, were laid freely open; Mr. Simpson, clerk to the Commissioners of Supply, gave ready access to the County records; and those of the Custom-house were also placed within the author’s reach by Mr. Millar, the collector. Many valuable manuscripts written by the late Mr. W. F. H. Arundell of Barjarg, were in the most handsome manner lent by that gentleman’s son, Mr. W. F. Hunter Arundell, to the author, with liberty to use them, and were found to be of great service as regards the genealogy of County families. He has also had the advantage of receiving valuable materials and advice from Mr. Robert Carruthers of Inverness; and he begs also to acknowledge the services rendered in various ways to the work by the Rev. James Dodds of Dunbar, the Rev. Wm. Bennet of Moffat, Mr. James Starke of Troqueer Holm, Mr. James H, M’Gowan, town chamberlain, Dumfries, Mr. Robert K. Walker, town clerk, Maxwelltown, and Mr. Joseph Irving of Dumbarton, author of an excellent "History of Dumbartonshire." 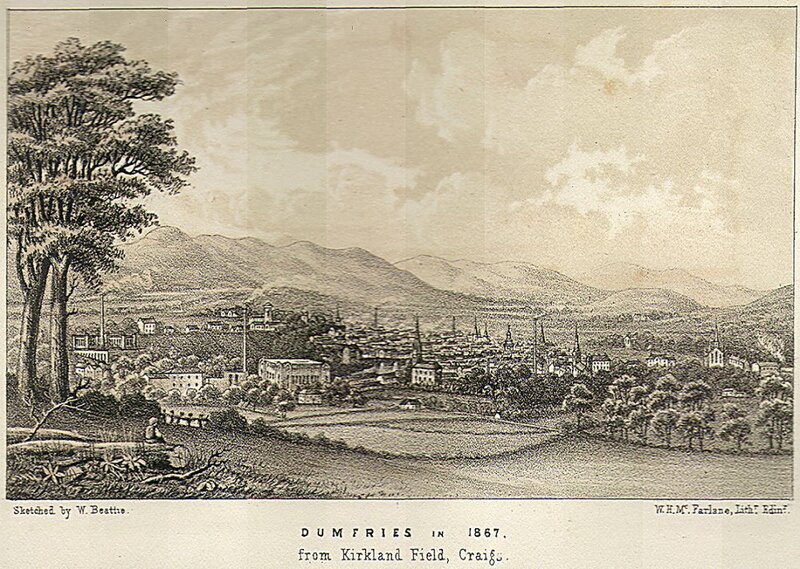 The long, deadly feud that raged between the Maxwells of Nithsdale and the Johnstones of Annandale, and which sometimes deeply involved the Burgh of Dumfries, has never hitherto been fully narrated; and if the author has succeeded in clearing up some mysterious passages of the quarrel, his success is due in some measure to information received by him from Mr. Charles Stewart of Hillside, and the late Mr. Francis Maxwell of Breoch. Regarding the common lands of the Burgh, no one in Dumfries, we believe, knows so much as Mr. Robert Paterson, V. S.; and the author feels that, without his aid, which was cordially given, he could not have presented so much reliable information upon the subject as he has done in these pages. For a photograph of the Lady Devorgilla’s seal, as appended to her deed endowing Balliol College, Oxford, the author owes his thanks to the Master of that College, Dr. Robert Scott. Correctly copied on stone, the effigy and arms of this illustrious woman constitute, it is hoped, an acceptable vignette for a work relating to the Burgh of which she was a munificent patroness. 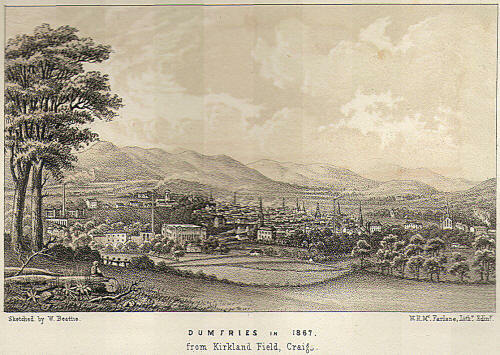 The view of Dumfries in 1777 is taken from an etching presented to the author by Mr. David Laing. To the preparation of this History the precarious leisure matched from five years of a somewhat busy life has been devoted. The author, in surveying the result, sees much that might have been improved; but he trustfully commends it, with all its defects, to the generous consideration of his fellow-townsmen, and Dumfries readers everywhere, on whose verdict its failure or success must mainly depend. Siege of Carlaverock Castle by Edward I.